THIS BLOG CONTAINED OF VARIOUS VIEWS ABOUT ANY ISSUES. I WILL BE VERY PLEASED IF YOU CAN SHARE YOUR INSPIRATION AND ASPIRATION FOR THE ADVANCEMENT OF OUR CAPABILITIES AND WISDOM. I have already decided in mind that the last day I serve my office as a civil servant, I have to go to one of my most favorite place in Indonesia, Yogyakarta. I love this city because people in the city are very committed with their cultural value that is a real Javanese culture. This city is not only best known as always keeping up the Javanese tradition but also as “the City of Student” or “Kota Pelajar”. Many students from all over Indonesia studied and graduated from various universities here such as from Gajah Mada University, Islam University of Indonesia Sunan Kalijaga, Universitas Sebelas Maret, Christian University Duta Wacana, ASRI or the Academy of Fine Arts just few examples of reputable Indonesian Higher Education institutes here around. Many intellectuals, researchers, professors as well as foreign students graduated or at least join a further studies in Yogyakarta, most popular subject among others are: cultural, arts, medical, law and agriculture. People here live very peacefully and governed by a Sultan as the Governor of Yogyakarta Special Region; the recent one is Sultan Hamengku Buwono X. The city or Yogyakarta existed since 1755, after the division of Mataram Kingdom into the Sultanate of Yogyakarta and the Sultanate of Surakarta (Solo). Yogyakarta is geographically located in between three most important international gateways of Indonesia, Jakarta, Surabaya and Denpasar (Bali). The four cities are well connected by various kind of transportation such as bus, train, air plane from and to almost all air ports of Indonesia. Chartered and scheduled flights from foreign countries could also landed at Yogyakarta airport Adi Sutjipto. Yogyakarta is also the only big city in Indonesia, which still has traditional Becak (rickshaw-style) as its public transportation and these kind of transportation facilities, including foods and hotels are available at a very reasonable price and that attract people from all over Indonesia and overseas to come and spend longer time in Yogyakarta rather than other cities in Indonesia. The demonstrators and the becaks. 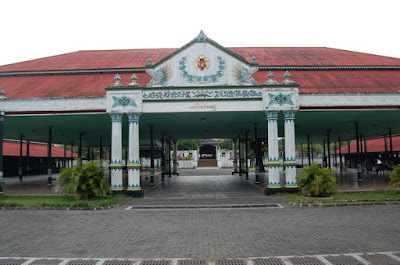 The key attraction of Yogyakarta is Kraton (the Sultanate Palace). It is the center of Yogya's traditional life and despite the advance of modernity; it still emanates the spirit of refinement, which has been the hallmark of Yogya's art for centuries. This vast complex of decaying buildings was built in the 18th century, and is actually a walled city within the city with luxurious pavilions and in which the current Sultan still resides. The average daily temperature of Yogyakarta range between 26 and 30 degrees Celsius with its maximum 35 degrees. Average humidity is 74% or range between 65% and 84%. Yogyakarta has a tropical climate with only two seasons, that is rainy and dry. 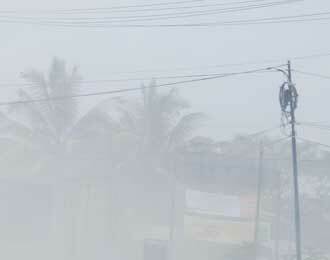 Usually the wet season begin in September to April, and the dry season begin from end of April till end of August. The monthly rain falls in Yogyakarta varies between 3mm and 496mm in which those above 300mm take place during the month of January up to April. The heaviest rainfall usually occurs in February while the lowest commonly happens between May and October. Average annually rainfall is about 1,900mm. Daerah Istimewa Yogyakarta (Yogyakarta Special Region) is one of Indonesia's 33 provinces; and one of the most densely populated area of Indonesia. This region is located at the edge of an active volcanic mountain, Mount Merapi that had been erupted several times. The biggest eruption was in 1672, killed about 3,000 people, the following eruption in 1997 and 2001 no casualties were recorded, however eruption in 2006 claimed to kill 2 people and the current eruption that still occurs from October up to November 2010 had taken life of 37 people including the key holder of Mount Merapi, Mbah Maridjan. There was a mystical story about the key holder of Merapi, Mbah Maridjan or grandpa Maridjan. He was entrusted by The Sultan Hamengku Buwono IX (the father of the current Sultan Hamengku Buwono X) to watch over the volcano's spirits, dispatching his assistant to go to the crater and remind people about when and what the spirit of Mount Merapi wants. According to the Javanese traditional believe, the Sultan himself should maintain the harmony between the Merapi, the Keraton and the Southern Sea. In that order the Sultan has to assigned the Merapi and the Southern Sea Watcher respectively and marry with the Queen of Southern Sea (Ratu Roro Kidul) and regularly serve an offering (“Sesajen” consisted of foods, flowers etc) to the crater of Merapi, so that his people will live in peace and bless with foods and all kind of necessities (usually agricultural products) from the fertilize Merapi soil. But the current Sultan is a very modern Sultan and a devoted Islam. He is a monogamous and has no concubine (selir) although this is allowed and a bit compulsory in Javanese royal tradition to have concubines. He keeps up the Javanese tradition on the offerings, but I hardly believe that he keeps the tradition of marrying the Ratu Roro Kidul or do the offering as to worshiping the Mount Merapi. He did that just to keep the tradition alive but at the same time gradually build the awareness of his people that this dogma is not a Religion. Besides of that not all of his people are Islam, some still hold the Javanese Believe the so called Aliran Kepercayaan or A Stream Believer that is very close to the believe of Javanese tradition; and some of course hold other religions such as Christian, Catholic, Buddhist, etc. 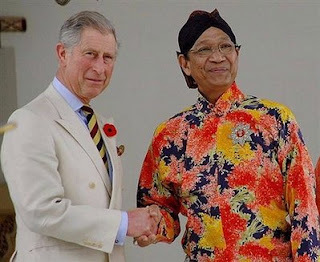 As a modern Sultan it is obvious that the Sultan Hamengku Buwono X relied more on the seismologists prediction about Mount Merapi than Mbah Maridjan prediction. He even clarified publicly that the function of mbah Maridjan was not as a Merapi Watcher or the guard of Merapi or the Key Holder of Mount Merapi, but the function of Mbah Maridjan was to prepare at any time if the Palace or the Keraton has a regular ceremony such as the offering to the Merapi Mountain. 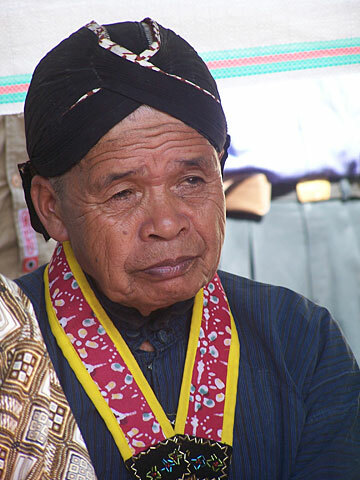 However, many people of Merapi and mbah Maridjan himself believe that he is the guard and the key holder of Merapi as entrusted by Sultan Hamengku Buwono IX, and that assignment has never been withdrawn till the death of the previous Sultan, meaning that he still keep and has to maintain that assignment and trust respectfully for what ever cost even with his own life. There was a disappointment from the current Sultan, because the Sultan has a very strong believe that the accident should not have taken life of his people if they just abide by the advice of the seismologists or the government officials on the danger of Merapi eruption rather than abide by the advice of Mbah Maridjan. So, when the Merapi began spewing its 600 to 2000 degree gases down the mountain's slopes in about 200 miles speed per hour and to the sky, no one from Mbah Maridjan Village that located just 4 kilometers from the crater had enough time to escape and run away from the disaster. Actually, a week before the first current eruption (26 October 2010) all routes to Mount Merapi﻿ were closed to public as the alert status of one of the most active volcanoes in the world was raised to “standby,” just one level below a full-blown eruption. 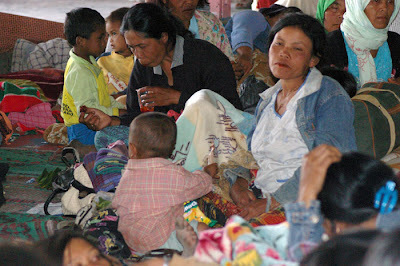 All residents on the slopes of the mountain including Mbah Maridjan had been advised sternly to stay outside at least 10 kilometers radius from the peak of Merapi and to stay away from around the rivers since the lava may spew out at any time and flow along the river and would cease them away. Only authorized personnel could enter the alert area to monitor the observation posts that located in certain areas but not too close to the peak of the mountain. Before I left Jakarta, heading to Yogyakarta on the 27 October 2010, I already aware about the danger of Mount Merapi eruptions, but since I have already booked a hotel and the plane ticket, I was really reluctant to cancel it, let alone knowing the fact that Yogyakarta located 40 kilometers from Mount Merapi. When I arrived in my hotel room, I can feel a little tremor, according to the news, since 22 October 2010, deep volcanic earthquakes occurred seven times, shallow volcanic earthquake 34 times, multiphase volcanic earthquakes 321 times and lava splashed 93 times. On Thursday 28 October 2008 in the morning, I and my daughter Angie went for a shopping in Malioboro the most well known shopping compound in Yogyakarta, about 200 meters from Jentra Hotel where we stayed. We went to a traditional market Bering Harjo to look for some Batiks, since Batik is Indonesian design pattern that has been acknowledge by the United Nation as one of Indonesian national heritage. After shopping, we walked around and took some pictures of interesting spots, such as the Presidential Palace, the monuments of Yogyakarta Kembali or the Return of Yogyakarta, the traditional market Bering Harjo and the student demonstrators who strongly complain on the poor government service in the educational programs that not even pro to the poor! They also complain on the slowness of the government to tackle on the Merapi victims and the Tsunami earthquake victims in Mentawai islands of West Sumatra that happens almost coincidentally with the eruptions of Mount Merapi! Well, I don't blame the students for these, because I totally agreed with the students that the government never learns from previous experiences and revise the educational programs and victims of natural disasters in the right and appropriate ways. I donate a bit for the Merapi victims through the students activities, I don't want to go to Merapi area, since I might have interfered with the rescuing programs that still continue up today. Some foreign tourists took the opportunity of approaching nearby the area for filming the rather scarce occurrences. Well, they have every right to do that although that was not a good idea at all. I returned back to my hotel room at about 01.00 pm, but Angie had decided to went out again strolling around Malioboro to find a little souvenirs for her siblings. At about 04.00 in the afternoon I heard a very strong boom, and a big quake shake me for at least a second. From the third floor of my hotel room I saw the mountain far across my bedroom window spew a very big smoke and fire, I didn't realized that it was Merapi that exploded, because according to the taxi driver, we can't see Merapi from Yogyakarta, but it was indeed Merapi that I saw and what a pity was I didn't take my camera to shoot and recording the occurrence. When Angie arrived from her shopping, I told her what I saw that I am now convince we can see Merapi from our room; so the next morning and afternoon of 29 October 2010, I was able to record the Merapi activities on that particular date as you can see in the pictures below. At around 01.00 am of 30 October 2009, I felt so difficulty breathing, I can't sleep and felt so uncomfortably like tons of bricks pressing my diaphragm and stopped me from breathing, so I asked Angie just to put some balm at my back and I used inhaler to release my chocking nose. After few hours it helps and I can sleep a bit. At about 09.00 am when we were having breakfast, I saw all the roofs turned to white, I told Angie that it was Merapi's dust that covered all over the roofs and the streets around. She hardly believe it, because she never saw that before. 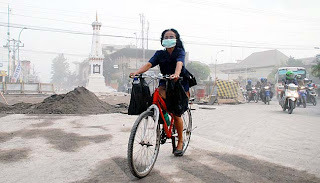 Well, I saw that kind of dust once when I returned to my home town Berastagi, North Sumatra in last September 2010, while Mount Sinabung just erupted, so I was right in recognizing the dust of Mount Merapi by then. Knowing, that we were about going out, the receptionist gave us some masks; and yes, almost all of the whole part of Yogyakarta was covered with dust of Merapi about 1 cm thick. Eventually, Merapi was re-erupted several times between 01.00 to 08.00 am on 30 October 2008. People then were all busy cleaning their houses, gardens and cars, because the dust is so dangerous for the breathing system. 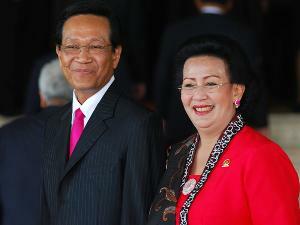 I returned back to Jakarta on Saturday evening 30 October 2010. All passengers of Garuda Indonesia Airline had to fly not from Yogyakarta, but moved and took the Garuda flights from Solo about 60 km from Yogyakarta to avoid dusts and the 2000 centigrade Celsius degree of the Merapi's smoke or hot cloud that dangerous for the air planes safety. I arrived back in Jakarta at 07.00 pm in the evening carrying various emotion from sadness of watching the Merapi and the earthquakes victims in both sides Merapi and Mentawai Islands from the television news; and a little relief that I and my daughter Angie still safe and luckier in not to experience those horrible tragedies. Indonesia's deadly volcano Mount Merapi still produced another powerful eruption on Nov 1, at around 10.04 am, spewing superheated clouds into the air. Mount Merapi produced two intense eruptions; on the 26th of October 2010, the pyroclastic flows killed around 37 people and on Sunday October 31, a strong explosion that had never been occurred earlier was heard. According to the seismologist experts, the eruption will continue to occur along November and it is difficult to predict the power since Merapi still keep so many lava and other materials that need to spew out from inside of its magma. It was predicted that this time Mount Merapi would produce greater eruption than those in 1997, 2001 and 2006. BSD City, 2 November 2010.
wish everything will be fine..
wеblog or еven a blog from start to end. BUYING HOUSE ABROAD? CLICK HERE AND CHECK IT OUT! View! Who knows you are here! I WILL BE VERY HAPPY IF I CAN SHARE MY EXPERIENCE AND KNOWLEDGE WITH ANY ONE. FOR ME, LEARNING IS A NEED; AND IN THIS LIFE REGARDLESS THE PROFESSION OR EDUCATIONAL BACK GROUND ONE HAS HAD, EVERY SECOND IN ONE'S LIVE WOULD NEVER STOP HER/HIM FROM LEARNING PROCESS.